As a professional photographer, protecting your images is a vital part of your business and your personal brand. In essence, copyright is a photographer's livelihood, and PPA advocates for U.S. Copyright Law improvements by lobbying Congress and working with other visual artists' associations to make a difference and help YOU be more protected. Below are some handy copyright-related resources that PPA members can use at all times. Check them out and, until you choose to join PPA, take the necessary steps to protect your work! 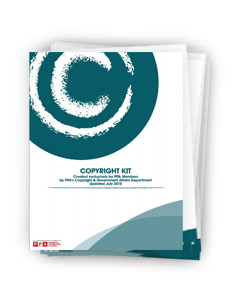 PPA's Copyright Kit – you can get it for FREE! As a photographer, you HAVE to know the basics on how to protect yourself and your valued work. As a nonprofit, PPA helps protect PPA members in particular, and all photographers in the U.S. in general. This is where you'll find PPA's Copyright Kit available to members and non-members alike. Bookmark it or download it! Know that you can sign up for FREE to watch live webinars, but you'll have to be a member of PPA in order to replay them whenever is convenient for you. Here's where you can find PPA's upcoming free webinars. PPA provides its members support with a whole host of Contracts and Forms. We're here to help you be more protected, and that takes expertise and time. That's why, when you join PPA, you get access to a large library of ready-made contracts, binding agreements, and other forms for you to edit, compare, and use as needed. These are of huge help! If you feel your work has been infringed upon, but you don't know what to do about it, PPA can help…but even more so if you are with PPA: If you are a member and think you've been infringed upon, you'll only have to answer 2-3 questions (it takes no time and is done online) to get help tailored to your specific case. You'll even get the proper DCMA takedown notices, certified letters to the infringing parties, or steps letting you know when it's time to contact an attorney. This Copyright Infringement Assistance tool is designed to point PPA members in the right direction, with steps to stop the infringement! It's quick and painless...because having your work stolen is painful enough! Professional photographer Eden Bao explains why SWOT (strengths, weaknesses, opportunities, and threats) analysis has been invaluable for making good strategic decisions in her photography career.